Welcome to the ibis Grenoble Gare hotel and its family-friendly atmosphere! The room itself had a fantastic view of the river/mountains and i found the room to be very clean and spacious, with a good sized bathroom. The staff were really friendly and helpful - explaining how we could park our car and it was really good value for car parking outside the hotel - we were able to leave the car there for the day also. We also had a late breakfast and staff were extremely accommodating. Very warm welcome, professional staff at reception, rooms clean as expected, really enjoy my weekend. Location very close of the train station, about 1 hour from Lyon airport. Looking forward to come back soon! Service was good. The room was very clean but exceedingly small for the price tag. Window sound insulation was poor so despite the nice view the night was noisy with the busy avenue in front. The room door used actual keys, not the now standard and safe card keys. The bathroom was clean but the shower was poorly designed and maintained. The shower doors did not close thight so water spilled all over the bathroom! A real mess. The elevator was actually on floor above ground level, so you have to take stairs to reach it, making access to people with disabilities very difficult if not impossible. Really, this hotel is a 90's relic with 2017 prices. My husband and I stayed here for the 11 nights of our holiday, and were delighted with the warm welcome and the quality of the hospitality. The reception staff were exceptionally helpful, efficient and friendly - they made us feel thoroughly welcome and nothing was too much trouble for them. 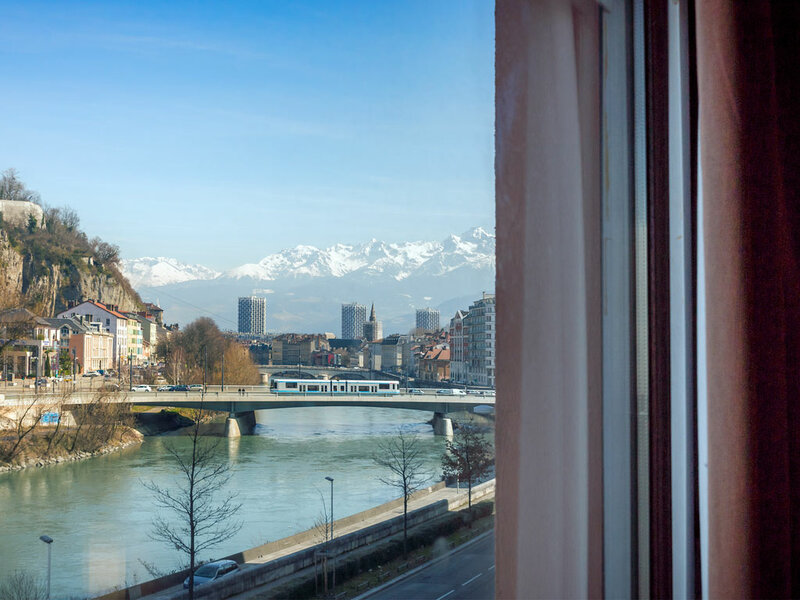 Without asking, we had been given rooms with a fabulous view over the Isère river, a typical example of the thought which the reception staff put into making our visit an enjoyable one. The rooms were spacious and immaculately clean; as always in ibis hotels, the beds were blissfully comfortable. Can't comment on the breakfast as we didn't try it. A huge thank-you to all the staff of the ibis Grenoble Gare, as they made us feel completely at home. We look forward to our next visit! The hotel was fantastically located adjacent to the river, close to the bus station, the centre, and my customer. Functional. Pleasant breakfast. Grenoble is a town with much character. I would go again. Very pleasant and helpful staff. Fast check-in/check-out. Clean and comfortable room. This non-smoking hotel has a very good location close to both the train station and bus terminal. The room was quiet and clean. It was also roomy and well equipped. The staff members at the reception were all very friendly and helpful. The pillows smelt the cigarette, the bed was not confirmable and breakfast was really bad. Very pleasant stay, rooms larger than the usual IBIS, staff extremelly friendly and helpfull. I was generally satisfied with my stay in room 108, although I would like to point out a few possible improvements: - each time I came back in the evening my door was kept closed but unlocked by housekeeping, and I found this a bit unsettling. I would prefer if housekeeping would lock the door after them. - the furnishing of the room is very basic. While I understand that you cannot provide more amenities (e.g. kettle for making tea of instant coffee) like in Mercure hotels, I would appreciate to at least have paper tissues in the bathroom - there are exposed electric wires under the electric heater - the room was hot one night and I didn't manage to make the air conditioning work. I forgot to tell it to reception during my stay as the room was at a good temperature the other nights Best regards. Briefly, I'd say that the staff is not welcoming nor friendly at all. One day I came back in the evening and the door of my room was open. I complained and I the only thing I got as an &quot;excuse&quot; was two cans of sprite. Zero customer service behaviour. I'd NEVER come back to this place. I stayed 5 nights and my sheets were never changed. They even once left the remote control under the sheets after the cleaning up. Good location with beautiful scenery by the window. Very very hot, poor climate control during a heat wave. Room was far too hot. Cleaned room when we left a &quot;do not disturb&quot; sign on door. No ice or refrigeration. Positives: breakfast, location. I 'm often in this hotel. Actually I sleep more night in this hotel than in my home bed. All the stuff are now my best friends I feel very comfortable.They all welcome me. When I call to reserve a room are able to recognize my voice. Excellent hotel stuff. Travelling through France chose this Ibis for one night at Grenoble. Easy to find, friendly and helpful staff. Secure car parking at the rear - free. The hotel appears to be only a little above the Etap standard - adequate, but not what one would expect from an Ibis. Perhaps the standards have been changed - but we also stopped at Auxerre, Beaune and Versailles Ibis hotels on the same trip and they were marginally better standard. The air-con was very poor.